We love discovering magical places that truly feed the soul, and Luskentyre Beach in the Outer Hebrides is one of our favourites. 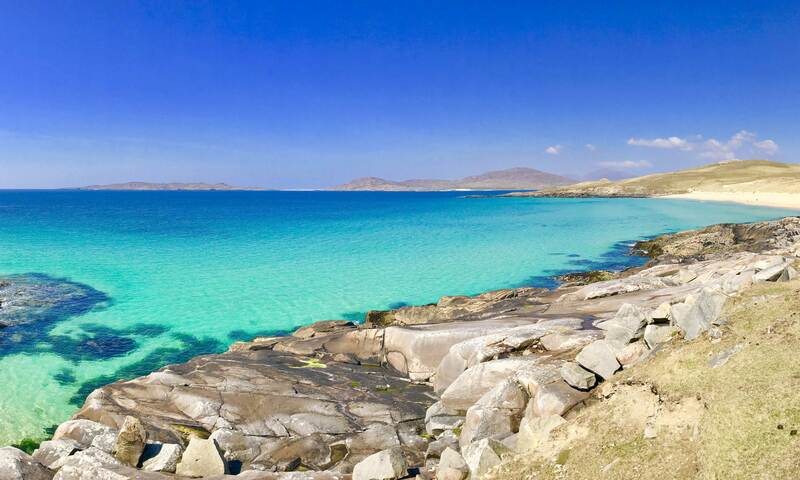 Wilderness Guide Tim Willis tells us why he calls this particular beach on the Isle of Harris ‘a little slice of heaven’. Click here for image gallery and key info on the Outer Hebrides. Over the years as a guide with Wilderness Scotland I have come to realise that Luskentyre is a place where you can press the pause button. Where you can forget about the frenetic pace of modern life. It’s here where you can tell the world that you’re getting off the merry-go-round for some ‘you time’. Very little changes here: only that day’s particular arrangement of incredible views, vivid colours and rhythm of crashing waves on the beach. In the age of technology, Luskentyre is a place for us humans to unplug and recharge. Just press pause – I promise it doesn’t take long for the magic to happen. Whenever I am guiding our walking trips to the Outer Hebrides and Skye I find myself scanning the weather forecast and tide timetable sites with near obsession. I know that if I can share Luskentyre with my clients at just the right time it has the absolute wow factor. The perfect day has plenty of sunshine with a few white fluffy clouds dotted around for extra contrast for the photos. The tide is neither fully in or out with just enough water to bring out the astonishing aquamarine and turquoise hues over the bay. When you first see it you have to pinch yourself to make sure you are not dreaming. 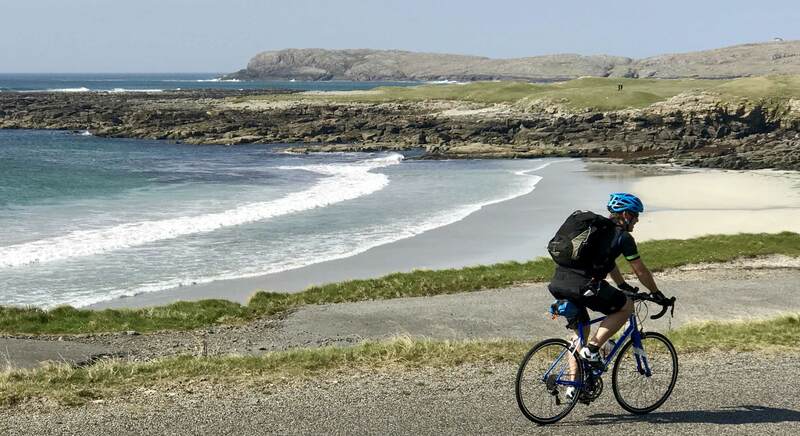 Another amazing way to appreciate the turquoise waters of Luskentyre Beach is to cycle the 3-mile single track road that links the beach to Harris’s main road. On a blue-sky-day, when the tide is just right, the three-mile journey is punctuated with many stops to take ‘just one more shot’ as the vistas and colours change. This little treat comes on day 4 of our Outer Hebrides Road Cycling trip and I always aim to take our groups along this road. It’s a real joy to see our clients’ faces as the views get better and better the closer we pedal towards Luskentyre’s white sands. On our walking trips, we invariably jettison our boots and socks at the first opportunity and stroll down barefoot to the crystal-clear water. The cool white sands should give us a hint but it’s only when the water rushes up the beach to meet our toes that we realise its Caribbean appearance is a folly. With a toe in the cool temperature of the Atlantic Ocean any ideas of swimming usually go firmly out the window! The chilly water is soon forgotten once we arrive back to the dunes. This is the moment to find a good spot to lie back on and take in the incredible panorama in front of you. When we’re ready to move there’s a wonderful circular 4km walk that offers up new perspectives on the beach and its many vistas. I’m always careful to time it right though as the tide can come in at a fair rate and it would be a chilly walk home otherwise. From Luskentyre the mountains of North Harris, provide a wonderful backdrop and a reminder that the islands offers us some really wonderful hiking. Up into these wild and remote hills, is a place where golden eagles soar and where even those with the most hectic of lifestyles back home, can find peace and solitude and a chance to truly get away from it all. I never tire of climbing cracking hills such as Ceapabhal and An Cliseam (Clisham) on our High Points of the Outer Hebrides tour. Read this blog from Travels with a Kilt about his recent trip with us that culminated in a visit to Luskentyre. 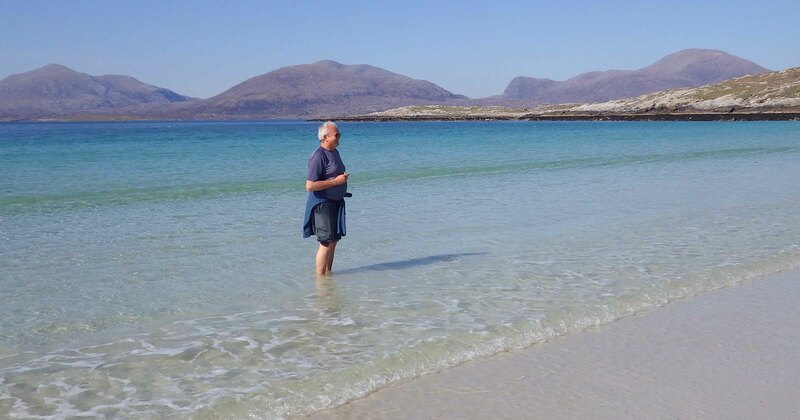 I would travel to Harris just to get my little slice of heaven on Luskentyre Beach but as beguiling as the beaches are the island has so much more to offer. I love making time to stop in at some of Harris’ galleries or to visit the new distillery. While the Hearach single malt is maturing the distillery has created the very popular Harris Gin which comes in the most beautiful bottle and tastes divine. And maybe you’ll visit the weavers and buy yourself some world-famous Harris Tweed. But if it’s refreshments you are after then pay a visit the Temple Café in Northton – it’s a Wilderness Scotland favourite, and for good reason. It has knock out views, a cool vibe inside, some mouth-watering homemade food and is run by a great team. For dinner we love to take clients to the community owned North Harbour Bistro on the nearby island of Scalpay (joined to Harris by a bridge). Always book early though – word is out how great it is. Beaches, mountains, lovely food – Harris really is a great place to explore.The more you explore the island you’ll realise there are plenty more deserted white-sand beaches to savour. As well as beach walks the island is abundant with wonderful low-level trails and I especially enjoy these ones as each has their own interesting story – maybe I’ll share them with you someday soon. Each year when we guides are allocated trips I keep my fingers crossed that I will get another chance to visit that little slice of heaven that feeds my soul. Fancy joining me on Luskentyre Beach? Check out our tours in the Outer Hebrides!